New figures reveal that birth tourism numbers in Canada are much greater than official statistics suggest. A Policy Options study by author Andrew Griffith noticed that while Canadian Statistics recorded 313 births to mothers living outside Canada in 2016, the original number might be higher than 05 times greater. It means the problem – where non-resident women purposely arrive in Canada to deliver birth to obtain citizenship for their children – is significantly more severe than several had believed. The consequence of this method can no longer be defined as insignificant and given its impact on the citizenship integrity and public attention that birth tourism is a false shortcut to getting citizenship, Griffith addresses. The inconsistency came to light while non-resident birth numbers produced by a particular health facility – Richmond Hospital located in the province of British Columbia – surpassed the officially reported figures for entire Canada. Griffith used figures from the from the Database of Discharge Abstract (DAD) of the Canadian Health Information Institute, which revealed there were 3,223 births of non-residents in Canada in the year 2016. 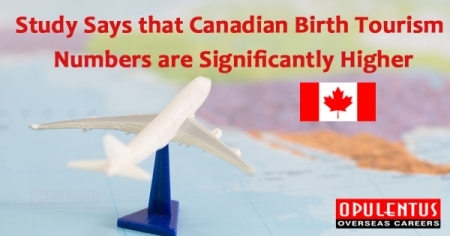 This number is not illustrative of birth tourism simply, as it also involves other temporary residents (along with international students and corporate transferes) and returning of Canadian expatriates to deliver birth. The sum also does not involve the Quebec, which declined to publish the information. Stay Updated with our newsletters to get the latest updates and information on immigration and visas. We request you to fill up the free evaluation form presented by Opulentus to take the initial step for your Visa and Immigration Process. We have more than 18+ years of experience in Overseas career and Immigration Industry.